An excellent sound bar to improve your TV sound. Give you a better sound quality for watching movies, listening music and playing video games. Bluetooth Pairing Mode: Wireless Bluetooth connection matches your smart electronic products, which can provide you a convenient experience. 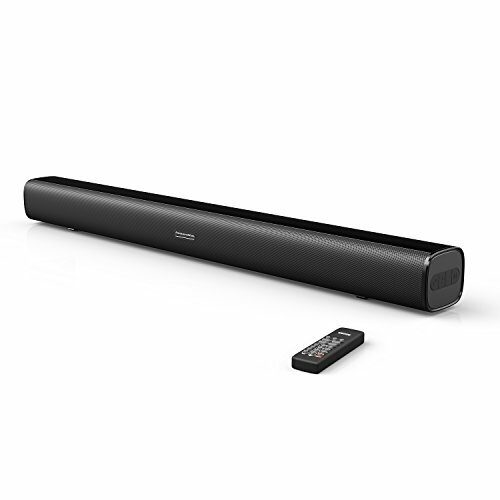 Line in Mode: Connect the soundbar by AUX/Optical cable. Enjoy the music by your connected device. USB Mode:Plug in the USB stick, the music in the USB stick will play automatically and you can use the remote controller to control it. ♬ 29.5-Inch 50 Watt 2.0 Channel Bluetooth Soundbar ♬ ~ Our sound bar has 2 x 25 Watt Speakers and digital amplifier with DSP inside. 2.0 channel Home Surround Theatre System provide you a loud and clear surround audio experience in bedroom and living room. ♫ Wired and Wireless Connect ♫ ~ Our sound bar has both wired AUX\Optical\USB input and wireless Bluetooth Pairing Mode, which can fit your different requirements. ♪ Easy Control and Operation ♪ ~ Infrared remote controller displays different modes through different colored LED lights. ♩ Unique Design ♩ ~ Our sound bar has unique 29.5-Inch smooth appearance design, Rubber Antiskid for safety stand, LED indicator light and sensitive button. Much easier for user to operate. ♯ Excellent TV Speaker ♯ ~ An excellent sound bar to improve your TV sound. Give you a better sound quality for watching movies, listening music and playing video games. If you have any questions about this product by Smilism, contact us by completing and submitting the form below. If you are looking for a specif part number, please include it with your message.